Once seen, never forgotten - a simply stunning addition to your patio this summer. The blue potato bush, Solanum rantonnetti, is an arching, normally evergreen shrub with colourful, funnel-shaped flowers. 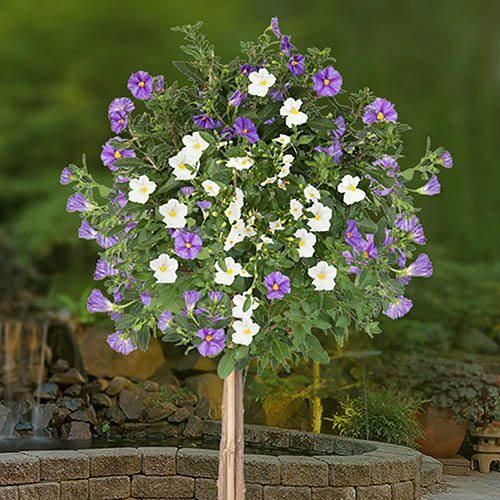 Normally blue flowered, it's also found in a white form, our growers have taken both and skilfully combined them into a single, ornamental standard patio bush. Covered in an eye-catching cloak of the deepest violet and brightest white flowers, this member of the tomato family is often used as an alternative for the Mediterranean Bougainvillea with excellent, garden-worthy results. Holder of a prestigious RHS Award of Garden Merit, you can be assured that this striking standard shrub will perform beautifully in your garden. Hardy down to -5C, Perfect for growing in the conservatory or outside on the patio in summer, this perfectly formed standard bush is easy to keep and maintain, just needing an annual clip and winter protection to keep it looking beautiful. Supplied as an established standard shrub, 75cm tall including pot, ready to go onto your patio. Water regularly, making sure that the soil does not dry out completely between waterings.